A friend wrote, I'm pondering - darkness doesn't exist, it's just the absence of light. There is no evil, just a lack of goodness. Hmmmm. If we were limited to logic, that could follow, good could be the absence of evil. The reality in history and experience however is that evil is real, intentional, personal and proactive. Our dear mother passed "from death to Life" (John 5:24) on June 21, 2008 following a series of strokes. Born in Holland April 20, 1925, she married her beloved husband Johannes (John) Moerman on March 10, 1948. The photo to the right shows them as much in love after 55 years (5 years of engagement during the war years and 50 years of marriage) as when they began. 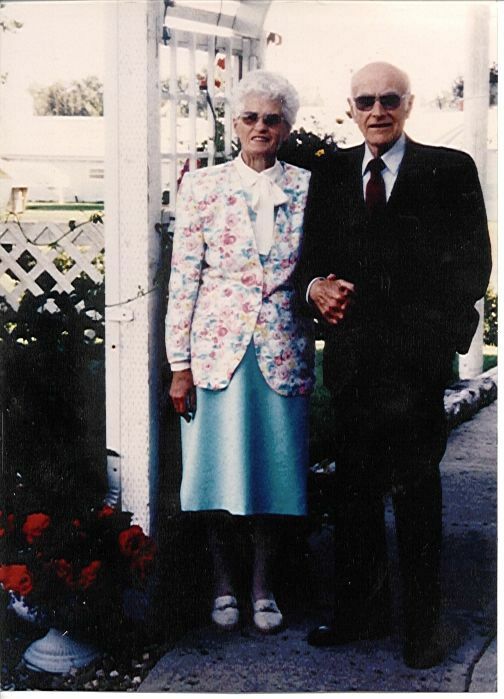 After 50 years of loving and raising their children and of fruitful ministry as a pastor's wife, she was widowed on March 28, 1998. She left a rich heritage! - 8 children, 28 grandchildren and 15 great-grandchildren. We rejoice in her loving life, godly example and faithful devotion to her family, many friends and Lord and Saviour Jesus Christ. Our mother's greatest joy is that you too would trust Christ the Saviour and join her in Heaven. After her first stroke at age 80, she made friends with a word processor and begin to type, with one and sometimes two fingers, with the desire to record her memoirs which you may read or download, in PDF or Rich Text Format, by clicking on the appropriate link below.